Product prices and availability are accurate as of 2019-04-19 07:21:32 UTC and are subject to change. Any price and availability information displayed on http://www.amazon.com/ at the time of purchase will apply to the purchase of this product. 1 Kg (2.2 lbs) of PLA, (aka Polylactic Acid), spooled for 3D Printing use. PLA is a bioplastic which transitions quickly from liquid to solid. This makes it an ideal printing material, one of the most commonly used in consumer 3D printing (along with ABS). 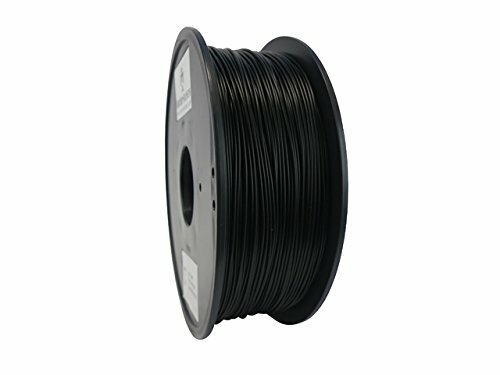 When printed, Black PLA will have a glossy, opaque finish. PLA is a multipurpose material commonly used in 3D printing. PLA is a bioplastic, which means it is made from renewable natural resources such as corn starch and tapioca products. As a biodegradable material it is much better for the environment, especially compared to petrochemical-based alternatives (such as ABS). Our PLA is compatible with nearly all 3D printers, including RepRap derivatives and those from MakerBot (such as the Replicator and Replicator 2), Ultimaker, Bits from Bytes, Airwolf3D, Makergear, Printrbot, Bukobot, Type A Machines, and many others. If you have questions about a specific printer not listed, please contact us. At MatterHackers, we tend to favor PLA as our default printing material due to its high strength and minimal warping. Recommended Extrusion Temperatures: 185C-205C. Dimensional Accuracy: ±0.07mm. All filament comes sealed in a bag with desiccant. We recommend keeping it stored that way until you are ready to use it. Spools not in use should be kept in an airtight container.